is a fully integrated ERP software solutions that fulfills the core business needs of midsize to large organizations. – The possibility of using the system by several companies overlapping through several departments and users, whether through a single computer or a local network of computers. – Make accurate accounting entries for all types (sales, purchases, stores, customer accounts, depreciation of fixed assets, notes receivable and currency valuation). – Maintain confidentiality and data protection through a multi-level security and protection system. – Use Arabic and English. – There is immediate help covering the system and a comprehensive user manual. – The system complies with Egyptian, Arab, American and international accounting standards. – Adjust the system format according to user needs. *Delta ERP software solution serves as a solid business process platform which supports continuous growth, innovation, and operational excellence. 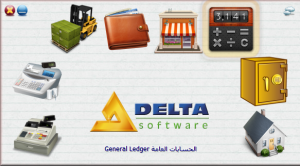 *Delta ERP Software serves thousands of customers in Egypt, Saudi Arabia, Qatar, United Arab Emirates, Sudan & Libya….etc .